The Federal Register notice announced a public meeting and three teleconferences in September and October 2015 relating to the review of the draft report. Comments on the draft assessment are due by 28 August. More information about the study can be obtained at the EPA Website. 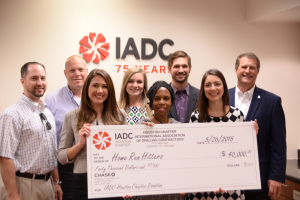 On 2 June, the IADC Houston Chapter donated $40,000 to Home Run Hitters International, which creates interaction and meaningful communication opportunities for children with disabilities. Money for the charity was raised at the Chapter’s annual Dinner Dance and Silent Auction in February. The chapter also donated $55,000 to the Oilfield Christian Fellowship, which distributes bibles throughout the industry. Money for the charity was raised during the Chapter’s annual Oilmen Christian Charity Clay Shoot. Since 2003, the IADC Houston Chapter has raised nearly 1.65 million for various charities and scholarships. IADC Houston Chapter members present a check to Home Run Hitters International. From Left: From Left: Brian Townsend; Jeff Kessler, Chapter Chairman; Christine Thorp, Par Petroleum Corporation; Leslie Packard, IADC; Dr. Deborah Carr, Home Run Hitters; Andrew Gordon, Cameron; Allison Fraser and Scott Gordon, Helmerich & Payne. In anticipation of the 21st United Nations Conference of the Parties, to be held in December 2015, the International Energy Agency (IEA) has produced a new report, World Energy Outlook Special Report on Energy and Climate Change. Peak in Emissions – set the conditions to achieve an early peak in global energy-related emissions. Five-Year Revision – review national climate targets regularly, to test the scope to raise ambition. Lock in the Vision – translate the world’s climate goal into a collective long-term emissions goal. Track the Transition – establish a process for tracking achievements in the energy sector. Increasing energy efficiency in the industry, buildings and transport sectors. Reducing the use of the least efficient coal-fired power plants and banning their construction. Increasing investment in renewable energy technologies in the power sector from $270 billion in 2014 to $400 billion in 2030. Gradual phasing out of fossil-fuel subsidies to end-users by 2030. Reducing methane emissions in oil and gas production. The full report, along with the Executive Summary, can be accessed via the IEA website. A commitment to finalize concrete and feasible recommendations for the G20/OECD Base Erosion and Profit Shifting Action Plan by the end of the year. Improving international information networks and cross-border cooperation on tax matters, including through a commitment to establish binding mandatory arbitration in order to ensure that the risk of double taxation does not act as a barrier to cross-border trade and investment. Endorsing actions on Trans-Pacific Partnership, Transatlantic Trade and Investment Partnership, and the EU-Japan FTA/Economic Partnership Agreement. Commitment to the initiative on Strengthening Assistance for Complex Contract Negotiations (CONNEX), aimed at providing multi-disciplinary expertise in developing countries for negotiating complex investment agreements, focusing initially on the extractives sector. The full declaration can be accessed via the G7 Germany website. The European Commission (EC) recently initiated the “Survey on Offshore Oil and Gas Equipment 2015 – Cost of Compliance with EU Product Safety Legislation”. The EC intends to examine the feasibility of extending the scope of EU product safety legislation to include equipment installed and used on mobile offshore units. As an initial step, the European Commission’s Joint Research Centre (JRC) Institute for Energy Transport is conducting a study on behalf of the Directorate-General for Internal Market, Industry, Entrepreneurship and SMEs, which will assess the impacts of a possible extension of the scope of ATEX, the Pressure Equipment and Machinery Directives, with respect to equipment intended for use in the offshore oil and gas industry. In order to achieve the best possible results, the Commission is calling for cooperation of all stakeholders to support the JRC in performing this study by participating in an online survey and/or interviews. The survey will conclude on 19 September 2015. To access the survey, please visit the European Commission website. The National Institute of Standards and Technology recently posted a revised edition of Publication 800-82 – Industrial Systems Security. The update provides information on how to secure Industrial Control Systems which includes Supervisory Control and Data Acquisition systems, Distributed Control Systems, and other control system configurations such as Programmable Logic Controllers. The document identifies typical threats and vulnerabilities to these systems and provides recommended security countermeasures to mitigate the associated risks. To access the revised Publication, please visit the National Institute of Standards and Technology website. Dispersants: surface application. This guidance describes what dispersants are and how they work when applied to oil slicks on the sea’s surface, including their capabilities and limitations. Common Operating Picture. This report provides recommended practice for GIS/mapping in support of oil spill response and for the use of GIS technology and geospatial information in forming a “Common Operating Picture” to support management of the response. Contingency planning for oil spills on water. This document provides guidance on the contingency planning process for potential oil spills in or on water following an accidental release of oil to a marine or aquatic environment, whether that be during the handling, transport, production or storage of oil products. Health Management Contract Guidelines for Clients and Contractors. This guidance is an addendum to the International Association of Oil and Gas Producers (IOGP) existing HSE Management – Guidelines for working together in a contract environment. It supplements the original report by providing a more robust and updated health management checklist. The guidance also assists clients/operators and contractors with determining their respective responsibilities and tasks. For more information on these guidances, please visit the IPIECA website. On 4 June, the IADC Drilling Engineers Committee hosted a Technology Forum to discuss Drilling/Completion Efficiency at Halliburton’s offices in Houston. Dual Multi-Purpose Tower Engineered to Cut Ultra-Deepwater Well Delivery Costs by Ed Adams, Huisman US. Drilling Engineers Solutions, by Akshay Sagar, Halliburton. Optimized Unconventional Shale Development with MPD Techniques, by Bhavin Patel, Weatherford. AccuTrak™ Passive Magnetic Ranging Service, by Robert Estes, Baker Hughes. Full content of all Technology Forum presentations can be found on the Drilling Engineers Committee page via the IADC Website. SEATAG AustralAsian Services Pte Ltd, Singapore (Conditional). Unit Drilling Company: Rig 302 (2). VIRTUAL MARINE TECHNOLOGY, VICTORIA, BRITISH COLUMBIA, CANADA.